Is your home or office in need of a little pick-me-up? Have you been stuck in the same colour scheme for longer than you’d like? We’ve heard this from clients before, which is why we’ve compiled this list of inspiring paint colours that are guaranteed to reinvigorate your space. It’s daring and deliciously dazzling and when combined with splashes of white and clever lighting, it adds a touch of warmth to the interior that is often missing in grey or off-white. Deep purple hues pair perfectly with almost any neutral colour scheme and injecting a touch of luxury and regal flair. 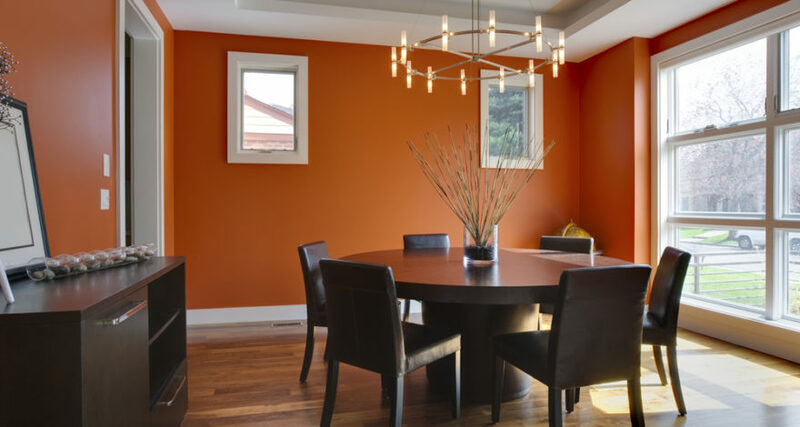 Orange colours can be tricky shades to get right, but when it’s done correctly, it adds a freshness and a sense of richness into a space. A shade of orange that is vibrant without being overbearing, tangerine looks fabulous against white, cream, pale blue and almost any shade of grey. It also perfectly complements fine timber furnishings. Searching for a new twist on neutral? Try a soft shade of green for a livelier alternative to off-white or beige. Soft green can turn an otherwise cold or bland space into a cosy, contemporary one that works well with neutrals. Perfect in the bedroom, living room, or home office, it adds sophisticated style without distracting from the flow of the space. Do you want a more masculine mood? Why not try a deep earthy tone, such as a rich mud. Earth tones are always appealing and work well with most interior decor colour schemes. They add depth and elegance to a space, and would work equally well with lighter furniture and furnishings. When used in a textured feature wall, the result is surprising and seriously stylish. If you’re tired of all-white colour schemes, consider a light grey gloss instead. It works seamlessly with white but adds a renewed depth and sophistication. While it can look sterile, accent colours in furnishings and accessories will give the room the lift it needs. A few indoor plants are all it takes to bring a pale grey room to life. Remember, you don’t have to paint an entire room for it to look new and refreshed. Even a feature wall can breathe new life into a space. To find out more about how APMG Painting Melbourne can help you to revitalise your home or office, call or email us today.